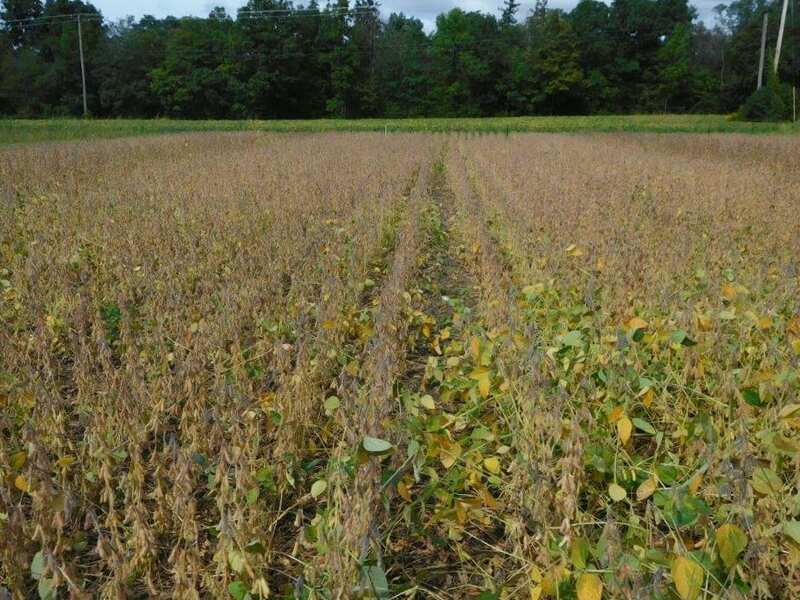 Conventional soybean remained weed-free throughout the season. Organic soybean was generally clean but the weeds were quite robust in locations of the field where weeds were not controlled. 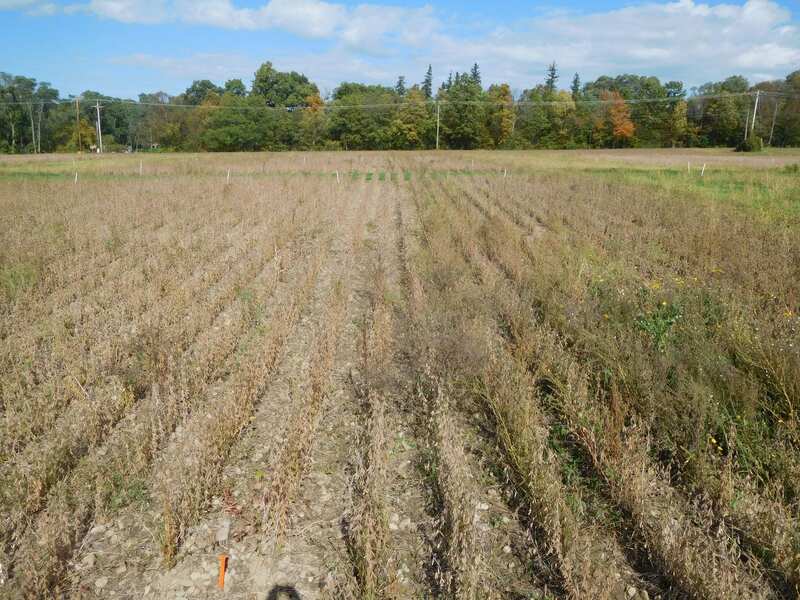 We initiated a 4-year study at the Aurora Research Farm in 2015 to compare different sequences of the corn-soybean-wheat/red clover rotation in conventional and organic cropping systems under recommended and high input management during the transition period (and beyond) to an organic cropping system. Unfortunately, we were unable to plant wheat after soybean in the fall of 2016 because green stem in soybean, compounded with very wet conditions in October and early November, delayed soybean harvest until November 9, too late for wheat planting. 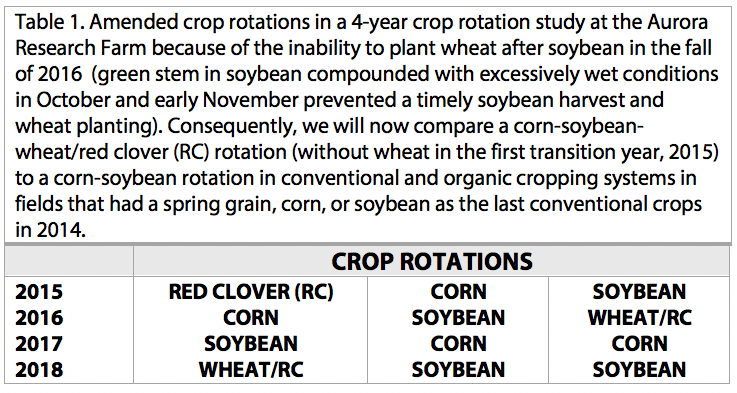 Consequently, soybean followed corn as well as wheat/red cover in 2018 so we are now comparing different sequences of the corn-soybean-wheat/red clover rotation with a corn-soybean rotation (Table 1). This article will focus on soybean yields in 2018 in both rotations. The fields were plowed on May 17 and then cultimulched on the morning of May 18, the day of planting. We used the White Air Seeder to plant the treated (insecticide/fungicide) GMO soybean variety, P22T41R2, and the non-treated non-GMO variety, P21A20, at two seeding rates, ~150,000 (recommended input) and ~200,000 seeds/acre (high input). P21A20 is a not an isoline of P22T41R2 so only the maturity of the two varieties and not the genetics are similar between the two cropping systems. We treated the non-GMO, P21A20, in the seed hopper with the organic seed treatment, Sabrex, in the high input treatment (high seeding rate). We used the typical 15” row spacing in conventional soybean and the typical 30” row spacing (for cultivation of weeds) in organic soybean. 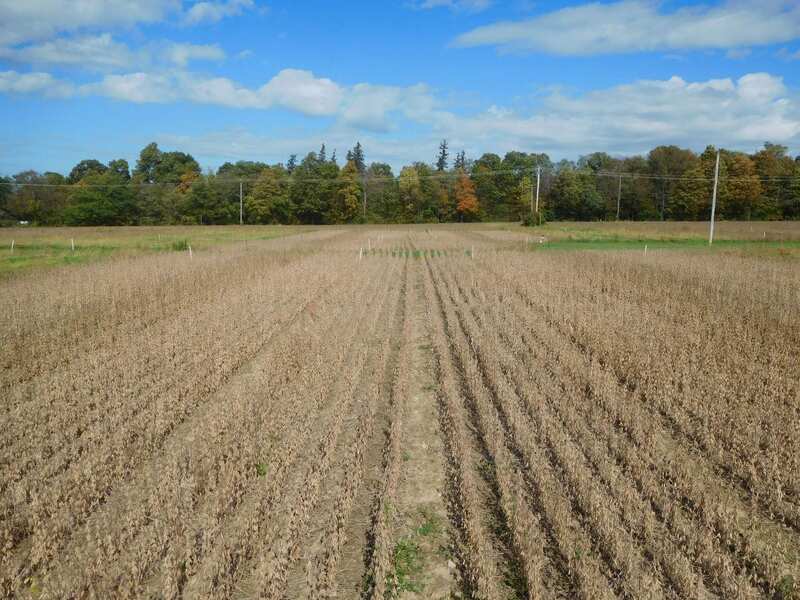 Consequently, the soybean comparison is not as robust as the corn or wheat comparisons in this study because of the different row spacing and genetics between the two cropping systems. We applied Roundup on June 20 for weed control in conventional soybean (V4 stage) under both recommended and high input treatments. The high input soybean treatment in the conventional cropping system also received a fungicide, Priaxor, on August 2, the R3 stage. We used the rotary hoe to control weeds in the row in recommended and high input organic soybean at the V1 stage (May 29). We then cultivated close to the soybean row in both recommended and high input organic treatments at the V3 stage (June 14) with repeated cultivations between the rows at the V4-V5 stage (June 19), the V5-V6 stage (June 29), the R1 stage (July 10), and the R3 stage (July 26). Weather conditions were exceedingly dry from planting until July 16 with only 3.12 inches of precipitation recorded at the Aurora Research Farm. In fact, the 3.12 inches of precipitation in 2018 was the driest 5/17-7/16 period ever in 59 years of record keeping at the Aurora site (http://climod.nrcc.cornell.edu/runClimod/1d121489c4dfec7b/3/). The Aurora Research Farm, however, received 10 inches of rain over the next 2-month period (7/16-9/15), the date when organic soybeans attained physiological maturity (R7 stage). The 10 inches of rain was the 8th wettest 7/16-9/15 period ever at Aurora (http://climod.nrcc.cornell.edu/runClimod/60f4a05670d22553/1/), which contributed to high soybean yields throughout the area. 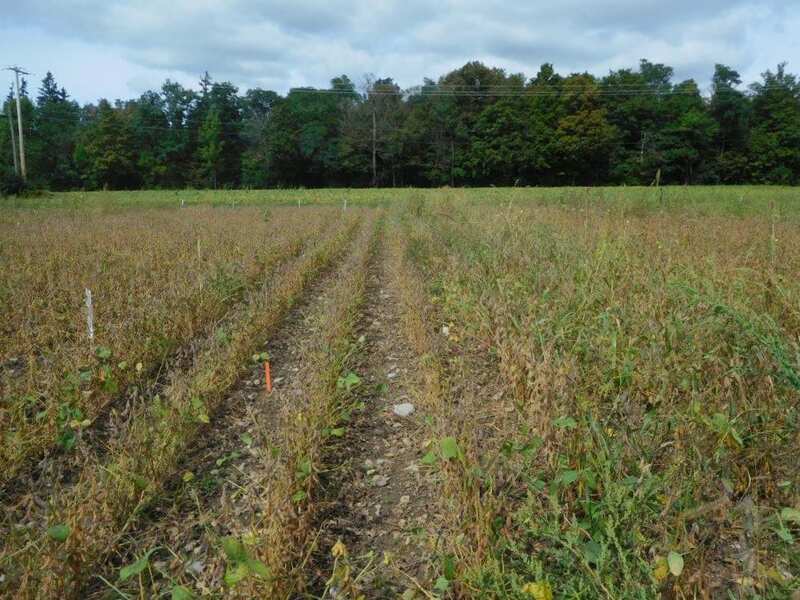 We discussed early plant establishment of our 2018 soybeans in a previous article (http://blogs.cornell.edu/whatscroppingup/2018/06/05/more-rapid-emergence-but-lower-early-plant-densities-v1-stage-in-organic-compared-to-conventional-2018-soybean/). Briefly, organic soybeans emerged earlier but only had 67-76% early plant establishment compared with 78-91% in conventional soybeans (Table 2). 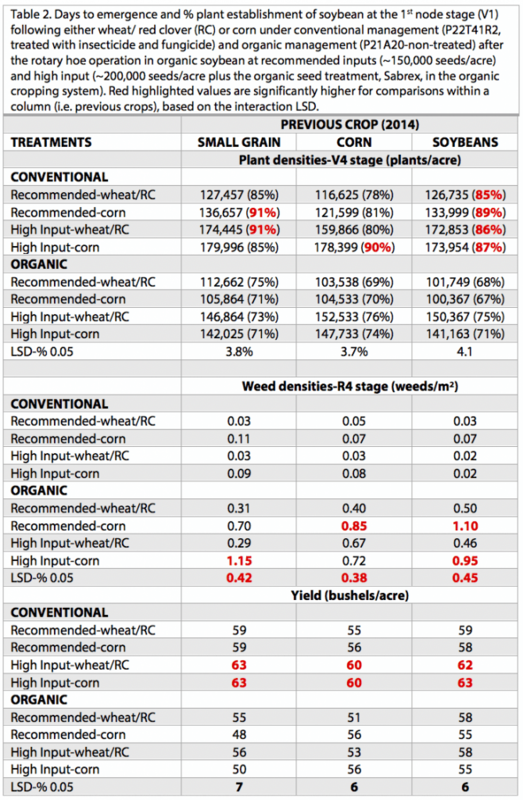 We noted that the organic soybeans with recommended inputs had early plant stands mostly below 105,000 plants/acre, and wondered if stands would be too low for maximum yields. We do not have our final plant stand data for soybeans completely counted yet so we are not sure if final stands in recommended input organic soybeans dipped below 100,000 plants/acre. Regardless, organic soybeans with recommended inputs yielded the same as organic soybeans with high inputs (~54 bushels/acre and ~55 bushels/acre, respectively), despite having 40,000-50,000 fewer plants/acre established at the V1 stage (Table 2). As in 2017, organic soybeans in the soybean-wheat/red clover-corn rotation yielded around 55 bushels/acre, a significant 7 bushel/acre lower yield than high input conventional management. Organic soybeans in the corn-soybean rotation yielded 53 bushels/acre, statistically similar to organic soybeans in the soybean-wheat/red clover-corn rotation. 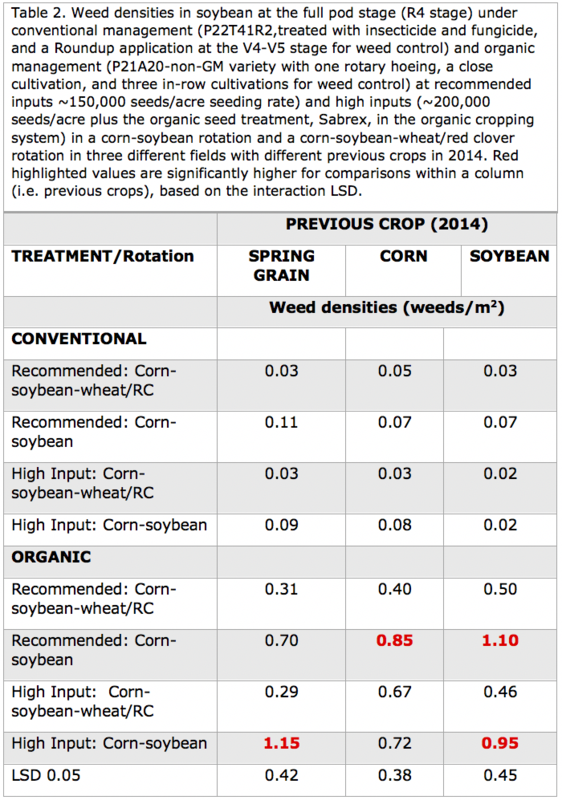 We thought that the extended rotation of the soybean-wheat/red clover-corn rotation in conjunction with its somewhat lower weed densities in 2018 (Table 2) would boost yields more, perhaps resulting in similar yields between organic and conventional soybeans. But that was not the case in 2018. What was the case, however, was the lack of yield response to higher seeding rates for organic soybeans in 2018, for the 4th consecutive year in this study. When averaged across the three previous 2014 crops (or three different fields) and the two different rotations (corn-soybean and wheat-red clover-corn-soybean), conventional soybean with high inputs yielded about 62 bushels/acre compared to about 58 bushels/acre in recommended conventional soybeans. The 4 bushel/acre yield response for high input conventional soybean was probably associated with the fungicide application rather than the higher seeding rates (conventional soybeans had average early stands of greater than 125,000 plants/acre-too high for a seeding rate response). We sampled two 1.52 square meter areas of each plot for yield component analysis so once those samples have been processed, we can determine if plant number, pod number, seed number, or seed weight contributed the most to the 4 bushel/acre yield advantage for high input conventional soybeans. If seed weight contributed the most, then the 4 bushel/acre response was probably associated with the fungicide application. In conclusion, conventional soybean yielded higher than organic soybean for the second consecutive year of this study. Organic soybean, however, would receive the organic price premium (typically more than 2x the conventional soybean price). Consequently, organic soybean, despite the ~10% overall lower yield, would be more profitable, especially at the recommended 150,000 seeds/acre seeding rate and no organic seed treatment. We will conduct a final economic analyses of soybeans and the entire study over the winter and write up the final results next spring or early summer.